LAS VEGAS, NV--(Marketwire - April 29, 2008) - Neterion®, Inc., the industry leader in 10 Gigabit Ethernet (10 GbE) adapters for server and storage environments, and Finisar® Corporation (NASDAQ: FNSR), a global technology leader in fiber optic solutions for high-speed data networks, today announced a demonstration of the industry's first Laserwire™ 10 GbE adapter, based on Neterion's industry leading Xframe E network interface solution. The demonstration will take place in Finisar's booth #2176 at the Interop IT Conference and Exposition in Las Vegas April 27 - May 2. Utilizing fiber optic technology for the transmission of data, Laserwire is a next-generation cable solution for low cost, high-speed serial connectivity. Integrating the Laserwire connector onto Neterion's 10GbE adapter provides serial 10 Gbps performance for multiple Datacenter Server Connectivity architectures, especially those that require flexible distances. In addition, Laserwire provides many advantages over copper cables including: a lighter weight cable compared to CX-4, lower power consumption compared to 10GBASE-T, and a small footprint ultimately leading to 10GbE LAN on Motherboard server architectures. "We are very pleased to partner with Finisar to demonstrate the industry's first Laserwire 10 Gigabit Ethernet adapter," said Greg Scherer, vice-president of product planning at Neterion. "As the market leader, Neterion is committed to pursuing the most cost effective and most flexible offerings to enable widespread adoption of 10 GbE. Finisar's Laserwire provides unmatched flexibility and power consumption for environments that need both short and medium reach cable solutions. This development has the possibility of completely changing the economics of connectivity in the data center." 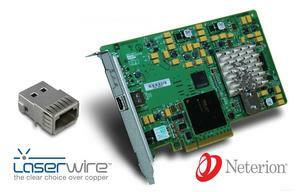 "We are proud to have been chosen by the 10GbE industry leader, Neterion, for the first Laserwire adapter card. This combined solution provides end-users with unprecedented flexibility for next generation Data Center Networks," stated Jan Meise, director of strategic marketing at Finisar. "Finisar's Laserwire cables and adapter modules for legacy ports such as SFP+ and XFP are the interconnect building blocks of choice for low power 10GbE Server Connectivity." For more information about Neterion products, please visit www.neterion.com. For additional details about Finisar's Laserwire or to download a Laserwire product brief, visit www.finisar.com/laserwire. Neterion is the leader in 10 Gigabit Ethernet adapters that provide high-speed solutions for customers' server and storage systems. It delivers the industry's highest performing line of 10 GbE adapters, allowing IT managers to virtualize many more applications per physical server -- including the most I/O-intensive ones -- drastically decreasing costs when deploying virtualized servers. The company was founded in 2001 and is headquartered in Cupertino, California with an additional office in Ottawa, Canada. More information on Neterion, Inc. can be found at http://www.neterion.com. Finisar Corporation (NASDAQ: FNSR) is a global technology leader for fiber optic components and subsystems and network test and monitoring systems. These products enable high-speed voice, video and data communications for networking, storage and wireless applications over Local Area Networks (LANs), Storage Area Networks (SANs), and Metropolitan Area Networks (MANs) using Ethernet, Fibre Channel, IP, SAS, SATA and SONET/SDH protocols. The company is headquartered in Sunnyvale, Calif. More information can be found at http://www.finisar.com. Neterion and the Neterion logo are registered trademarks of Neterion, Inc. Finisar is a registered trademark of Finisar Corporation. All other names are for informational purposes and may be trademarks of their respective owners.